Yeah, but: It's meant to be low-end. The Long Version: First of all, I'd love to meet the person who came up with the name "PIXMA Pro9000 Mark II". It's a gem. And naturally there's another printer that takes completely different inks but with a name that's only different by one character. For the purpose of this review, I'll simply be calling it the "9000", which is not to be confused with the Canon 9000F, which is the flatbed scanner that I use for documents and medium format negatives. They sit side-by-side next to my desk and make a cute couple. The 9000 is a 13" photo printer, able to handle cut sheets of paper 19" long. It uses high-end dye inks, which are supposed to offer the same longevity as midrange pigments. I have no way of testing that, but there are a couple of lingering dye-printer problems that the ChromaLife100 inks don't solve. One is that the ink needs time to dry: prints stacking up in the printer's output tray can stick together, and they shouldn't be judged for colour accuracy for a solid day. Handy. The other problem is that, once they dry, they really don't like getting wet. The fizz from an open can of soda can cause them to spot, and forget about handling a print with damp hands. For framed photos that stay in the house this isn't a big deal, but I'd never consider selling a print with that kind of weakness. Barnett Newman may get away with applying paint directly on top of masking tape, but I am not Barnett Newman. 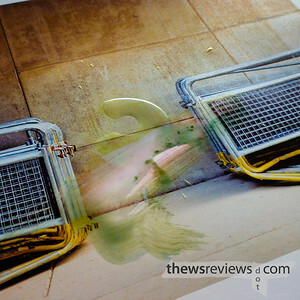 The shame of it is that the Pro9000 is actually a very good photo printer. The output is visibly better than the Epson R1800 that mine replaced, with very good colour output, and I've been satisfied with its ability to slowly produce monochrome prints using only its black tank. It even has the ability to print in black when a colour cartridge has run out, so even though I'm currently out of everything except for black and cyan, it continues to print email confirmations without complaint. I have to admit that I find the 9000 quite endearing. 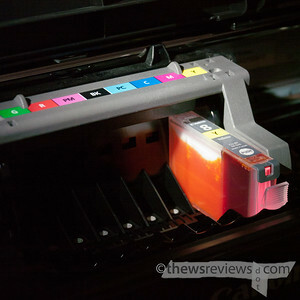 Canon's website, and many sympathetic reviews, have mentioned how quiet the printer is when it's working. They're absolutely right – often I won't realize when the print job is finished. It's harder to miss the beginning of the run, though, since it feeds paper with a pronounced "whirrr-THWACK!" It'll make me jump if I'm not expecting it. With the exception of the logistical issues around ink drying, I've been very happy with my 9000; it has done what I wanted it for and should have many good years of service ahead of it. It will need to find somewhere else to do it, though, since I've decided to move on to the Canon PIXMA Pro-1 when it's released. What can I say? I like its simpler name.